I began wood engraving in 1982 and have a sizeable portfolio of prints with subjects ranging from Maine landscape to Southwestern imagery. Check out my wood engravings at the galleries listed in the "About" page. 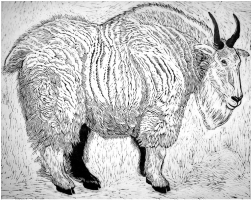 My woodcuts are generally larger scale often featuring animals. I use Japanese blocks (shina), papers and tools (hanga). These prints are best appreciated by viewing them in person at the galleries which represent me. Sign up for my newsletter for current exhibitions of my work.